Pilots and tankers! 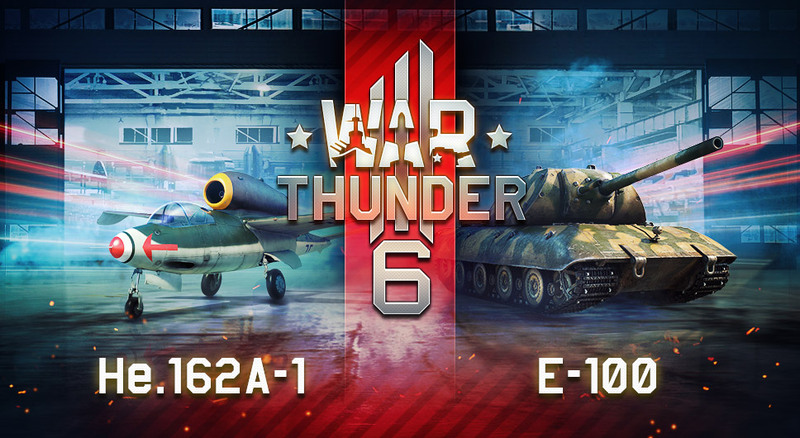 Take part in the special Tournaments during November 2018 on the tss.warthunder.com dedicated to 6 year anniversary of War Thunder and get a chance to win the coupon for the very rare E-100 tank or the “Volksjäger” He 162 A1 “Salamander” or both! Tournaments on the tss.warthunder.com portal will be in 1 vs 1 format for those who like to play solo and in 6 vs 6 for the players who prefer team play. Number of participants in the 1 vs 1 air and tank tournaments is unlimited! Each 1 vs 1 tournament additionally has the prize pool of 19,500 Golden Eagles and unique titles - “1v1 Master-Duelist” for the air tournaments and “Golden Legion” for the tank tournaments! Each Steel Legion 6 vs 6 tournament additionally has 119,000 Golden Eagles prize pool and a unique title for the first place - the “Steel Legion”! ARENA 6 vs 6 tournament additionally has 119,000 Golden Eagles prize pool and a unique title for the first place - the “Golden Legion”! Number of teams in each of the 6 vs 6 tournaments is unlimited. Coupons for the vehicles can be traded on the Market or you can keep them for yourself! since Tier V is nothing special anymore and gaijin still desides to put those vehicles as super rare event vehicles, i gave the hope up for reasonable events that have those two vehicles as prizes. and that some will sell them for 1000 GJC or more doesnt help the situation. I'm feeling quite angry. :-( Hey there,you Gaijin. When will start Store discounts? I can't wait for a store discount any more.